The identification code for the country that is specified in the SNS (in other words, the letters that precede the number). The SNS number (without any zeros that may appear to the left of the number). The SNS series (the letter at the end of the number). Following these instructions, the information identifying the notary to which a particular SNS has been assigned will be displayed. Open the application and scan the QR code with the device. The smartphone or tablet will automatically read the QR code, and the information identifying the notary to whom the particular SNS has been assigned will be displayed. The SNS is affixed to the authorized copies of notarial documents and to original notarial documents intended for circulation both abroad as well as within the country in which the document was prepared (country of origin). Is affixed to, at least, one of the sheets of the document, although it is advisable to place on each of the sheets that record the document. May be affixed anywhere on the page. If the document consists of several pages, and your chose to put an SNS on each sheet, in order to facilitate verification of the SNSs, the use of SNSs with sequential numbers (for example, IT000000000001001A, IT000000000001002A, IT000000000001003A) is recommended, but not mandatory. The SNSs will be affixed, as determined by the notary, either on each page, or on the last page of the document only. The SNS is designed to provide additional security to notarial documents to be circulated internally or cross-border. The SNS does not in any way replace legalization or the apostille. Consequently, original documents and copies thereof must be legalized or apostilled in accordance with the ordinary regulations in force in each country. The SNS (« Secure Notary Seal ») is a special double high-security deal which must be affiexed to both sides of a notarial document or copy to be circulated. Each SNS has a sequential number (consisting of several digits and one letter at the end to indicate the series), that can be used to identify the Notary to which it has been assigned. 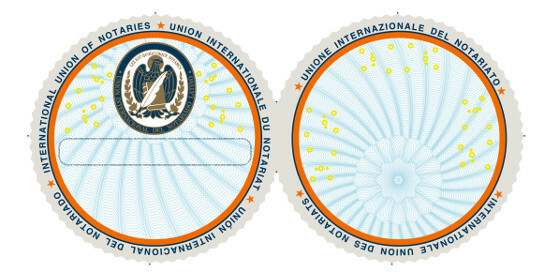 The only differences between SNSs are the sequential numbering, the identification of the National Notarial Body to which the notary of origin belongs, the identification of the Notarial Record number, as well as the year of the document which will be added by hand in the blank space assigned for this purpose under the UIN logo. What is meant by the term “SNS system”? The « SNS system SNS » is a system for the secure circulation of notarial documents on paper, based on the used of SNSs. What is the purpose of the SNS? first, it offers an additional guarantee of origin and material integrity of a document or copy thereof. second, it combats the increasingly widespread phenomenon of circulation of counterfeit documents or counterfeit copies thereof. Which documents or copies require the SNS to be affixed? The SNS is affixed by the notary « of origin» on the authorized documents or copies thereof intended for circulation, both abroad and in the country (for instance, originals or copies of powers of attorney, copies and/or extracts of a document, etc.). Under no circumstances should the SNS be affixed to notarial records. What is the cost to the client for the use of the SNS? The SNS system does not generate any additional fees for the client. Does the SNS guarantee the validity of the document? No. The SNS is simply an additional method of guaranteeing the origin and material integrity of a document, but does not guarantee its validity. Does the lack of an SNS on original document/copy have any effect on its validity and effectiveness? No. Validity and effectiveness are independent from the SNS. The SNS simply provides an additional guarantee of origin and material integrity of the document. Who organized the SNS system? The UINL (International Union of Notaries).In fact, on 19 October 2012 in Algiers, the Assembly of the International Union of Notaries approved the commencement of the experimental phase of the SNS system. Is this system legally recognized or regulated? No. The system is based on the free participation of the Notaries who have joined the UINL and signed the Contract of Accession. Must I affix the SNS even if the document has been legalized or apostilled? Yes. The SNS system is completely separate from the apostille or legalization and is a system organized by the worldwide body of notaries to provide additional security to the current system of document circulation. Does this system work all over the world? The system is based on the free participation of the Notaries who are members of UINL and have signed an Contract of Accession. After the experimental phases, has been running the SNS project? After the success of the experimental phases, in October 2016, the UINL launched the SNS project, following its adoption at the 28th Congress of the UINL, signing an agreement with the company Signe responsible for the manufacture and distribution of the SNS. Can I become a pilot notary? Yes. Any part of the UINL notary can use the SNS. To do so, your Notary Council, must first adhere to the project, through the signing of a contract with the company Signe. Once signed, the Notarial Council of the attached country sent to the company SIGNE a relationship of the notaries of the country. It will be the company Signe responsible for contact with notaries to give them access to sign up the purchase of the SNS platform. How is the SNS affixed? Click here for instructions on the use of the SNS. If the document contains multiple sheets, must I affix an SNS on each sheet? How do I consult an SNS? Click here for instructions on consultation of an SNS. Who can consult the website www.uinlsns.com? What must I do in the event of loss or theft of an SNS? I must immediately inform my national body, which in turn shall report the theft or loss to the International Union of Notaries for publication on the website www.uinlsns.com. Am I responsible for the safekeeping of the SNSs that have been sent to me? In compliance with the provisions of Law 15/1999, of December 13, about Protection of Personal Data (hereinafter "LOPD") and its implementing regulations, we inform you that the data collected through the Platform will be incorporated into an automated file of personal data of which SIGNE will be responsible, with headquarters in Avenida de la Industria 18, 28760 Tres Cantos, Madrid and registered in the trade register number 2 of Madrid, Volume: 8101 Folio: 95, Section 99: 3rd of the book of companies, Page: 78156-2. Your data will be processed in order to meet the different types of relationships that may arise with SIGNE as a result of applications, management, inquiries, contracts or arrangements to which the corresponding data collection form refers. The data processed are those collected by the appropriate form and those that arise during maintenance of the corresponding relationship. Data processed initially come from the International Union of Latin Notaries, which will provide the full name and email address of the individual Notaries who can access the services offered by the platform. Upon receipt of this information, SIGNE contact with them by offering such services. For the provision of services under the Platform, the User must complete a series of mandatory data, once filled, he will create a user name and password with which you can access these services whenever you need it. All fields that are marked with an asterisk (*) in any of the forms must be filled out, so that the omission of any of them may make it impossible for us to provide the services requested. Also, by sending data through the forms provided, you state that the information and data provided are accurate and true. SIGNE retain your data for the periods provided for each case legally and without prejudice to its right of cancellation. The data collected in the Platform may be disclosed to third parties for the purpose of verifying the authenticity of the sealed documents. Additionally, your data may be communicated to other third parties for other purposes when your consent is obtained for it in the legally required manner. Users may exercise at any time, their rights of access, rectification, cancellation and opposition to the processing of data and revoke their consent to the terms provided by law, writing to the postal address mentioned above or to the following email address: info-lopd@signe.es and attaching in any case a copy of the document proving his/her identity. In cases where you have specifically requested or when indicated your consent by ticking the box you will find, if any, in the forms of data collection. In cases where you have contracted with SIGNE regarding products and services similar to those employed and has not indicated its opposition at the time of data collection. In any case, you may refuse the transfer of electronic commercial communications by sending an email to the following address: info-lopd@signe.es or using the specific means recognized in the commercial communications submitted to you. In any case, we inform you that, so long as cookies are not necessary for the use of the Platform, you can easily reject and delete cookies installed on your computer. The procedures for blocking and removing cookies may differ from an Internet browser to another and, consequently, we kindly ask you to read the instructions provided by the manufacturer of the browser. Most browsers allow you to configure warnings by the presence of cookies or to reject them automatically. If you choose to decline cookies you can still use our platform, but some of the services will be limited. SIGNE reserves the right to modify this Data Protection Policy to adapt to new legislation, case law or interpretation of the Spanish Data Protection Agency. In this case, SIGNE announce these changes clearly and in good time indicating the modifications made and requesting, if needed, your acceptance of those changes. “SIGNE SA (hereinafter SIGNE), is a Spanish company established in Avda. de la Industria 18, 28760 Tres Cantos (Madrid-Spain) and Tax Id. No. A11029279. Registered in the Commercial Register No. 2 of Madrid | Volume 8101 | General 7029 | Section 3 | Companies Book | Folio 95 | Page 78156/2. Notwithstanding that access to the services offered by SIGNE needs the acceptance of specific conditions, access and use of the website www.uinlsns.com and all directories included under the same (hereinafter, collectively referred to as SNS Platform), and the products or services that can be obtained through it, subject to the terms described in this Legal Notice. If you are not in accordance with this Legal Notice, do not use SNS platform. Any use you make of it or the services included therein implies acceptance of the legal terms contained in this text. The SNS platform aims to provide access to the notaries participating to SNS management and ancillary, as well as promote the activities and services provided by SIGNE, so the information contained therein unless stated otherwise, it is such just for promotional purposes or, where appropriate, a mere invitation to contract and in no way constitutes a binding offer. All products and services contained in the SNS platform are sold or provided by SIGNE in accordance with current regulations. SIGNE reserves the right to make changes to the SNS platform without prior notice, in order to update, amend, modify, add or delete the contents of the Platform or its design. The contents of the Platform are updated regularly. Given that information updating is not immediate, we suggest you to always check the validity and accuracy of the information contained therein. The terms and conditions set out in this Notice may vary, so we invite you to review these terms each time you visit the Platform or request a new service. Also, this Legal Notice shall be understood without prejudice to any other General Conditions governing access to specific goods and services within the Platform. SIGNE expressly prohibits the making of framings or the use by others of any other mechanisms that alter the design, original configuration or contents of the SNS platform. SIGNE advertising or by other advertisers that we believe may be of interest can be inserted in the SNS Platform. Notwithstanding the provisions of the note “Data Protection”, SIGNE undertakes not to disclose information to advertisers, except anonymous statistical data on the use of the SNS platform, in order to improve the service and offer products according to the expectations of users. SIGNE complies with the Organic Law 15/1999 of December 13, Protection of Personal Data and other regulations in this area, and maintains a Data Protection Policy on personal data, which is describes mainly how SIGNE uses personal data, the user is informed in detail of the essential circumstances of such use and security measures that apply to your personal data to prevent unauthorized third parties to access them. SIGNE maintained in the Platform SNS all technical means at its disposal to prevent the loss, misuse, alteration, unauthorized access and theft of data and information that you can provide to SIGNE therethrough without prejudice that the Internet security measures are not impregnable. The User agrees to use the services of the SNS platform according to the terms stated in this legal notice and the mere use thereof will constitute acceptance of it. The user who acts against the image, good name or reputation of SIGNE, and who use illegal or fraudulent designs, logos or content of the Portal, will be liable against SIGNE of his/her action. Misuse of SNS Platform: SIGNE has created the platform for promoting the SNS and related services and to facilitate access to them, but can not control the use thereof otherwise than as provided for in this Legal Notice; therefore, access to the Platform and correct use of the information contained herein are the responsibility of those performing these actions, not being responsible SIGNE for the incorrect, illegal or negligent use thereof by the user. Use of content: SIGNE provides all the contents of its Platform in good faith and use its best efforts to ensure that they are constantly updated and in force; however, SIGNE can not assume responsibility regarding the use or access made by users outside the scope of the SNS platform, or the consequences that could result from the practical application of the opinions, recommendations or studies that can be accessed through the same, the final responsibility always lies on the user. Also, SIGNE will not be able to control the content that has not been made by it or third parties fulfilling its order and therefore will not be responsible in any way for any damages caused by such third party content. Advertising: SIGNE may include in the SNS platform own or third party advertising to provide you products or services that it considers that may be of your interest. However, SIGNE can not control the appearance of the advertisement, nor the quality and suitability of such products or services and therefore SIGNE will not be liable for any damages that may be caused to the user for these reasons. Virus: SIGNE undertakes to implement all necessary measures to try to ensure the user the absence of viruses, worms, Trojan horses and the like on its Platform.. However, these measures are not infallible and therefore SIGNE can not fully ensure the absence of such harmful elements. Consequently, SIGNE will not be liable for the damages that they could cause to the user. Technological failures: SIGNE has concluded all necessary contracts for the continuity of the SNS platform and make its best efforts so that it is not interrupted, but can not guarantee the absence of technological failures or the permanent availability of the Platform and products or services contained therein and therefore assumes no liability for damages that may arise from the lack of availability and access failures caused by disconnections, breakdowns, overloads or network outages not attributable to SIGNE. The design of the platform and its source code, logos, trademarks, and other distinctive signs that appear on it, belong to SIGNE or associated entities and are protected by the corresponding intellectual and industrial property rights. Your use, reproduction, distribution, public communication, transformation or any other similar or analogous activity is strictly prohibited without express written permission of SIGNE. The contents of the SNS platform are also protected by the intellectual property rights of SIGNE or third parties. The use of the content produced by SIGNE or any of its entities will be allowed only in the context of a contractual relationship with the same or with such entities. The trademarks, trade names or logos used in the Platform are owned by SIGNE or third parties which have authorized SIGNE to its use, and that access to the Platform will no grant to users any rights to trademarks, trade names or logos. The applicable law in case of dispute or conflict of interpretation of the terms in this Legal Notice and any matter relating to the products or services of this SNS platform will be the Spanish law, unless the rules of consumers and users protection establish the applicability of different laws. For the resolution of any disputes that may arise in connection with the use of the platform or the use and purchase of products or services that it can offer, SIGNE and the User agree to submit to the Courts of the User's place of residence, as long as it is located in the Spanish territory or any other jurisdiction whose applicability is imposed by the rules protecting consumers and users. Our shipments are made by the transport company Mail Boxes Etc. Transport or courier services require someone older than 18 years old to sign the delivery of the shipment. If at the time of delivery there is no one responsible to accept the goods, you will be requested to contact the transport or courier services to set an alternative delivery date or a place to collect the products. Delivery will be made in the address indicated by the client in the purchase Platform. For security reasons, deliveries must be made in person so we can not ship to PO Box (including Army Post Office or Fleet Post Office). Shipping costs are included in the product price. However, the consignee must pay for the cost of duties and local taxes. Approximate transit times are shown in the following table and correspond to numbered working days from the day following the date of issue of the order *. The terms indicated do not include the time that customs management might take. * Orders shall be issued within 4 working days after receipt in the purchase platform. The shipment of the order can be tracked through the SNS Purchase Platform SNS without prejudice for those countries where situation updating is not informed on time. The delivery is considered completed since the product becomes available to the Customer by the carrier and the consignee signs the delivery receipt. The consignee has to verify the products upon receipt and expose all the exceptions and complaints that may be justified. The goods may be returned within 30 days after receipt. Shall be subject to refund those orders of which good is incorrect, defective, damaged or in poor condition, provided that the damage is attributable to the manufacturing, transportation or shipment process. In this case we will arrange with the transport company Mail Boxes Etc. taking away and returning of the product to our factory and proceed to the automatic cancellation of the numbering of the returned SNS. Once we receive and verify the returned item, we will refund the cost of the goods or send the correct products. We will pay for the cost of returning as long as the Customer Service Department (support@uinlsns.com) has been previously informed and the department has concluded the taking away with the carrier Mail Boxes Etc. Any refund will be provided using the same method as that used in the purchase. The estimated time is two weeks from receipt of the returned merchandise. However, and in order to serve you a personalized service, please communicate us any incident is to the email address: support@uinlsns.com. The After-Sales Department will give you an incident number and we will inform you about the procedure to follow, always seeking for the most satisfactory solution.